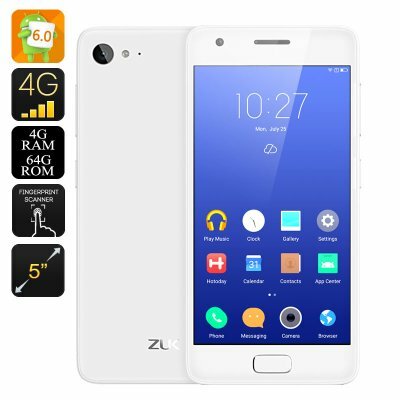 Successfully Added Lenovo ZUK Z2 Smartphone - Snapdragon 820 Processor, 3000mAh Battery, 13MP Camera, High Speed 4G Network (White) to your Shopping Cart. The Lenovo ZUK Z2 phone along with its amazing specs puts other Chinese flagship smartphones to shame. The Lenovo’s ZUK Z2 is one of these rare examples you come across every now and then - offering mind blowing specs for the price of a medium range smartphone. The device is powered by an epic Snapdragon 820 processor that is considered to be one of the most cutting-edge mobile processors ever created. It supports ultimate connectivity, graphics, photography, power, and battery efficiency. The powerful ZUK Z2 is guaranteed to never let you down while enjoying the most amazing features your smartphone has to offer. Along with its powerful hardware and Android 6.0 OS comes a massive 3000mAh battery that enables you to take the most out of this amazing device without having to charge it regularly. With a continuous battery life up to 14 hours this smartphone is guaranteed to live through the day after which it can be quickly charged in just under 2 hours thanks to its power charging mode. The ZUK Z2 has furthermore been equipped with a high-end 13MP camera that allows you to snap stunning HD pictures wherever you go. Its 8MP front camera gives you the option of snapping high quality selfies with all your friends and loved ones to ensure that not a single memory gets lost. Besides its epic Snapdragon 820 processor, massive 3000mAh battery, and amazing HD 13MP camera this smartphone has more to offer. The Lenovo ZUK Z2 is a dual SIM smartphone that accepts two Nano-SIM cards. Connectivity options include Wi-Fi, GPS, Bluetooth, 3G, and 4G. The phone has been equipped with a wide range of sensors including but limited to a Proximity sensor, Orientation sensor, Magnetic field sensor, Accelerometer sensor, Gyroscope sensor, Light sensor, and Linear acceleration sensor. And for all sport loving users the ZUK Z2 has added an integrated blood oxygen and heart real-time detection sensor that allows you to optimize your exercise schedule. With its stunning hardware, specs, and beautiful sleek design the ZUK Z2 is a true flagship smartphone whose full potential can only be uncovered by using the device by yourself. The Lenovo ZUK Z2 Smartphone comes with a 12 months warranty, brought to you by the leader in electronic devices as well as wholesale Lenovo cell phones..